The following questions cover the in-class presentation from Dr Rich Blake at Samuel Merritt University on Jan 24th and Jan 31st 2012. The students are encouraged to review the entire lecture material within the blog post below for more in-depth self study. 1. How does Sports Medicine differ from the regular approach to injuries in orthopedics? 2. What does the C stand for in RICE? 3. With contrast bathing, what are you trying to accomplish? 4. What is the 80% Rules for function and pain scale? 5. What does KISS stand for and how is it used in medicine? 6. What is the difference in a 2nd degree sprain vs a 3rd degree sprain? 7. What are common modifications to increase level of difficulty in the single leg balance exercise? 8. In the treatment of any tendonitis, what does the initials BRISS stand for? 9. What does Vit D3 do for bone metabolism? 10. What are the 3 phases of Injury Rehabilitation? 11. Name 3 common forms of strengthening exercises? 12. In Turf Toe is the primary injury dorsally or plantarly? 1. What are 5 common mechanical problems seen in gait? 2. What is limb dominance in gait? 3. When watching someone walk or run, where should your gait evaluation begin? 4. What are 3 orthotic modifications used for over supination? 5. Bonus Question: What are 3 potential benefits to the much maligned high heel shoe to the patient? This post is dedicated to Lynne. I recently sent a diabetic patient to a top wound specialist for an opinion. His recommendation to her was to use Winvivo Healing Balm. She definitely looked a lot better in the three wounds I had been trying to help her with. It can be used for superficial or deep wounds. It should not be used in the face of a possible infection. I believe the product has some great potential, but it is always trying to find out who it is beneficial for. Wound in a diabetic after I scraped the callus and dead tissue away (called debridement). Careful debridement is always the number one treatment for these injuries/sores. Application of Winvino to the wound bed. Closeup of the wound bed after application of the product. I like it because it can penetrate into a wound. I love another product called Acticoat when the wound is superficial. Electronics for Heel Pain: If this works, the Stock is definitely worth buying. My good friend Dr Karen Langone from Long Island, New York, posted this great article on her Facebook page. You should not need any more reasons to exercise. After you study the article from the New York Times, I will give you a quiz on PGC1-alpha, brown fat, and irisin. Does two irisins make one PGC1a or 2 PCG1a s make one irisin molecule? This is one product available for dry, cracked heels. Works well. This is an email from a typical patient expressing her frustration over a recent reflare of her symptoms. The symptoms are in the front of her foot, and a recent MRI showed no sign of fractures or neuromas. My foot has been flare up since Sunday after a yoga class, I have been using the contrast bath, but not too much ice though, according to the acupuncturist, she thinks that I need more blood circulation to improve the nerve problem. Icing is not a good option in Chinese medicine. Last time (Thursday) I visited her, we had a very good acupuncture session, she attached electrodes to needles to provide continued stimulation (like the Stim unit). After the treatment, I felt good, walked without any nerve problem for a while. Sunday morning I went to a yoga class, I felt OK during the walk from my home to the gym, but there were several standing poses in the yoga class that required strong foot position, then I felt a lot of nerve activities. After the class, I went home to apply a contrast bath, and it seems to quiet down a little. But yesterday and today, I can feel the nerve problem all the time even when wearing my MBT shoes or sneakers (on a better day, I can almost feel normal in those shoes). So now I'm applying ice, hoping it will not get any worse. I forgot to ask you if you have a diagnosis report that I can bring with me when I visit my Physical Therapist and my Acupuncturist. I went to my PT office on Friday, but they were not sure if it's OK to treat me with massage and ultra-sound, so they asked to see the doctor or MRI report and maybe your recommendation for PT. Also I want to ask you if it's OK that my Acupuncturist massage my foot, in her opinion, she thinks there is scar tissues developed, so she wants to deep massage them to break down the scar tissues. I forgot to ask you if you have seen any possible fracture in my MRI? These two days, I started to feel "similar feelings" as when I had the stress fracture on my metatarsal two years ago. Am I starting to get paranoid or is it really a fracture? Can you see it from the MRI if there's any fracture line, since we did not looking for fracture but neuroma, is it possible the MRI might miss a fracture line? I still have my immobilizer boot from two years ago, should I start to wear it, will that help to improve my condition? Here I present 2 videos on the importance of balance and ways to improve your balance. First, Coach Marc Evans discusses the importance of balance in running. Marc is a world renowned expert in Triathlons. Then, I present my own past video on single leg balancing: the Most Important Exercise in the universe. a heal lift verses a whole foot lift? I am curious to see what you observation is. Hey Tim, Thanks so very much for leaving a comment on the blog post entitled "Heel Lifts vs Full Length Lifts for Short Leg Syndrome". 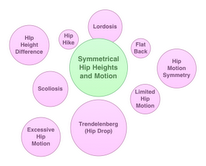 The schematic below is normal hip function in green and various motions or positions considered abnormal in purple. I see that there is a misprint which should read Hip Motion Asymmetry indicating different motion on the right and left. Over the years I have observed more Hip Hike with heel lifts vs full length lifts and more difficulty in general stablizing the hip height difference originally seen. For athletes who spend a lot or a bunch of time (just to irritate my high school English teacher) on the balls of their feet, the role of a heel lift is lessened in effecting change at the hip level and the base of the spine. All this been said, experimentation with each patient is important. Every doctor/therapist that uses lifts goes off some general rules initially. There has to be a starting place. I like to start with full length lifts (normally stop just before the toes). As I watch a patient walk with lifts, I want to see easy, fluid hip motion, a lessening or elimination of limb dominance (lean of the body to one side), no hip hike (jerk upward), no knee instability which could be a sign of hip instability hiding under the clothes, and for the patient to tell me that they feel more stable and centered. Compromises have to be made when there are toe fit issues, or when stability is not being obtained. Another doctor/therapist may want to start with heel lifts. As they treat the patient, they should evaluate in every shoe that the patient uses the lifts whether there is hip stability, hip evenness, elimination of limb dominance and no hip hike at heel contact. There are so many shoe styles, that patients often find that the same lift in one shoe that was working well, has some issues with another shoe. In general, the nuances can be worked out, but most just do not wear the lift in those shoes it does not seem to work with. So, to answer your basic question, I normally see smoother, more equal, less jerky motion at the hip and knee with full length lifts than heel lifts. But, if I was starting with heel lifts in a non-athlete that was not on the ball of their foot a lot, I probably could find some shoes out there that worked well for the patient in terms of these issues. I hope I was able to answer your question. 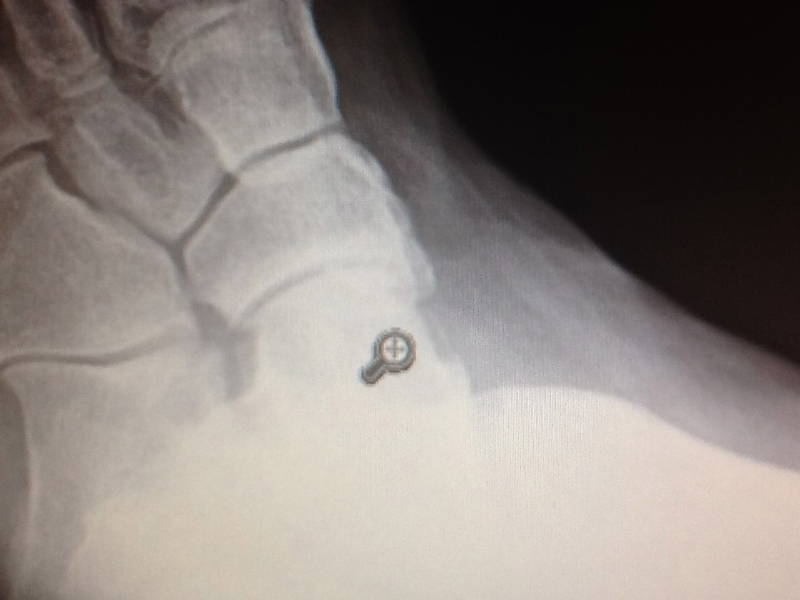 Is Ankle Replacement Surgery on the Horizon for Ankle Arthritis? The article above shows that there is hope that good ankle replacement surgeries will be part of the future. There is so much research in this area that I try to tell my patients that have advanced arthritis in their ankles to get cortisone shots as needed, wear high tops and ankle braces if helpful, and do daily ankle strengthening and anti-inflammatory measures (like ice packs). Occassional trips to the physical therapist or accupuncturist to control inflammation can also help. Get multiple opinions before agreeing to a fusion or replacement. Have a conservative podiatrist if possible be your ombudsman to sort through the information available from the surgeons. This patient has 6 months of arch pain right where the posterior tibial tendon attaches into the navicular in front of the ankle. The 2 X-rays demonstrate how standard foot X-rays, commonly ordered in emergency rooms or by standard protocols may not reveal the problem. This is a standard oblique foot X-ray which shows the outside of the foot better than the inside. Even though the pain was the inside of the foot, and even though I ordered an oblique view to isolate the inside of the foot, I still got the standard oblique view since it is ordered 1000 times more than other obliques. The marker highlights where the pain is, only it is hidden behind the bones. After sending the patient down to X-ray again, and writing more on another prescription pad, I was able to get the correct oblique. 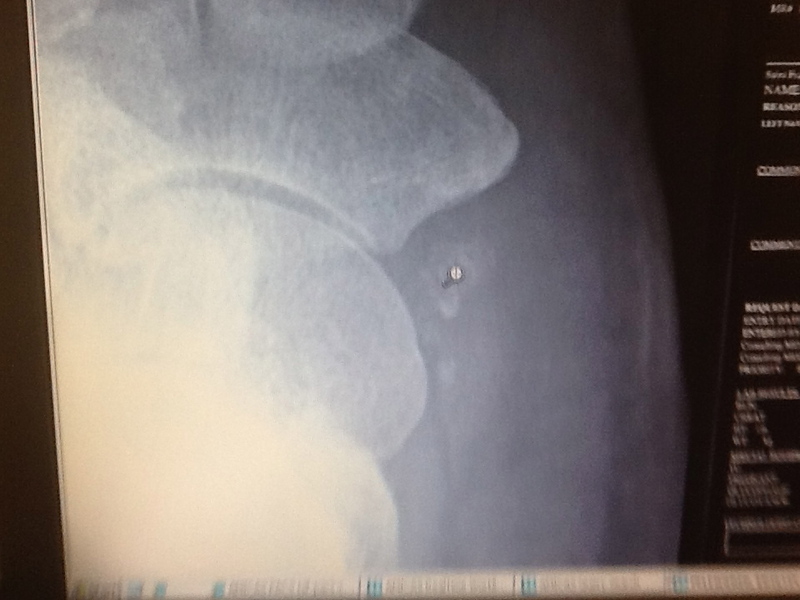 The marker shows clearly an accessory navicular bone, demineralized, and probably the cause of pain. Of course, I am now ordering an MRI to look deeper at the 3 Dimensional and tissue activity components. But, this example clearly shows how standard X-rays may not always show the problem, especially when specialized X-rays are needed and not routinely done at any institution. X-rays are normally correct when positive, but may be wrong when read as negative in the face of chronic pain. This is an email I just received with many interesting points to discuss. My name is Robin and I just made an appointment to come in to see you. I wanted to reach out and see if there is anything I can do to help my foot until then. Last night, I started feeling like I have a splinter in the ball of my right foot, especially when I'm walking, when I press the foot on the floor or when I lift my toes up. I'm nine weeks pregnant and wondering if I perhaps have developed planter faciitis. Since April, I also have developed a bit of atrophy in my right calf near my knee that I wanted to get checked out as well (I've had an MRI of it and have been to an orthopedist and the conclusion was that it's just atrophy, possibly from sitting cross legged). I also have a bunion developing on my right foot, however, and I believe I also have a bunion developing on the top of my right foot under my big toe so I'm wondering if I perhaps am developing hallux rigidus (I've read that calf atrophy can be a sign of this) or if the atrophy is from my patella femoral syndrome. I used to wear orthotics (got them about six years ago) for my patella and one foot being longer than the other (I was in pain at that time and wanted to be able to run again, which I eventually was), but I stopped wearing the orthotics earlier this year when I was worried they were worn out and potentially causing other problems. That's about the time I started developing the calf atrophy. I also have stopped running and doing major aerobic/weight lifting activity (outside of walking) since becoming pregnant so I'm wondering if that is contributing to what's happening with my foot. In sum, I'm wondering if there is anything I can do in the next week before I come in to help my foot (I started wearing the orthotics again today). I really appreciate the help and look forward to meeting you. Dear Robin, Thank you for the email and I look forward to seeing you. 1. Plantar Fasciitis tends to feel sore in the am when arising and primarily in the heel, although there are cases of it in the arch, and sometimes in the metatarsal area. Starting using an ice cube to massage the area in circular motion 3 times per day to reduce the swelling. Use can also look on the blog for the rolling ice massage technique with a frozen sports bottle. If there is swelling, use could try contrast bathing (also listed in a separate post) to reduce the swelling once per day. It is a 20 minute soaking process. Because it is an usual place for plantar fasciitis, it is more likely a bone bruise or stress reaction to one of the metatarsals. See the video on the KISS principle in designing a float or accommodation for the sore area. You can go straight to my youtube channel drblakeshealingsole. 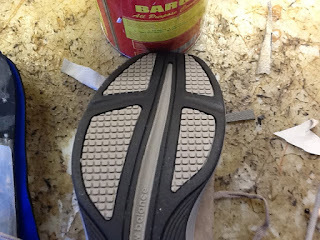 Check that area in all the shoes you normally wear to see if there is any rough spots. Do you think it is sports related? If you are right handed, and a tennis player for instance, you may pivot across this area more than on the left. Check the wear in old shoes on the shoe insoles to see if this area tends to always wear down faster. Check the skin for signs of the callus, wart, corn, etc. 2. In regards to the atrophy, it usually a sign of low back disc problems or muscle injury. A neurologist or physiatrist or chiropractor can evaluate this for neurological cause. Since you are pregnant, they will not do a low back MRI. The muscle involved should be weaker than the opposite side. Does it affect strength in any way? Look at the post/video on 2 positional calf strengthening and test the strength of the gastrocnemius and soleus on both sides. See if by doing straight and bent knee heel raises you can can find a difference that can be worked on. Use a tape measure and measure the calf size in the same place below your knee on both sides. See if you can record the difference to use as a reference point. If you have calf atrophy now of unknown cause, we have to assume it may get worse before it gets better. Atrophy can be from lack of use like with pain, or with abnormal function (like produced with hallux rigidus). 3. I will have to evaluate the bunion area for you. Do you have stiffness in the right big toe joint that is not in the left big toe joint? Do you have a history of pain near your big toe joint? Definitely wear your orthotics as much as possible until I see you to give me an idea how they work and feel for you. Read my posts on what to do for bunions, like toe separators and yoga toes. Definitely the pregnancy could cause some symptoms, but you would think that they would be symmetrical. It will be fun playing Sherlock Holmes, definitely one of my heroes. This is a comment to one of my posts several months ago. Thank you for the information Dr. Blake. I saw the podiatrist this week and he suggested removing the bone all together. 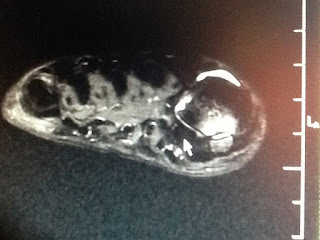 metatarsal at the ball of the foot. He mentioned using an incision on the top of the foot and the bottom of the foot. a plantar incision if it is the fibular or lateral sesamoid. He prefers the top so there is not a scar on the weight bearing part of the foot. surface, the visualization and ease of removal is worth the scar risk. Do you have information of which would be the better way to go? a little out of touch if recent research is involved. Do you have pictures of the actual procedure? Dr Blake's comment: Sorry, but I do not. I think I am coming to terms with having surgery. Is there a specific amount of time to wait that is suggested before surgery? I know you mentioned it would be acceptable after three months, but is there a golden time frame? treatment and testing showed initial improvement. This great video highlights the health and excitement that await us if we keep moving this year. Double or triple your calorie expenditures from last year. Walk around the block once or twice. Park a few extra blocks from the restaurant. Have a meeting with colleagues while walking. Take your vacation this year with more exercise in mind. If you can not walk, consider a stationary bike for home. Movement is the secret to health. Make sure you keep going. Let's make 2012 a Healthier Year. Received this email from a patient Jeff I had just. He is deciding on surgery for his Hallux Rigidus. There are many great points brought out in this correspondence. All of my comments are in red. I so appreciate the opportunity to meet with you and discuss options for my great right toe. 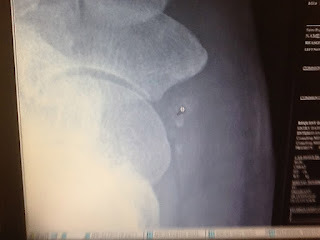 As we discussed, I was scheduled for a Cheilectomy (joint clean out procedure) with a good podiatrist on January 20, 2012. After our meeting, I emailed the doctor and told him I wanted to postpone surgery. He was very understanding and said I should only do surgery when I was ready. I wrote him again and asked him if he would order an MRI, so that both you and he could have more detailed information on my toe. Dr Blake's comment: I told Jeff that an MRI can reveal the extent of injury to the joint much better than X-rays and I would want them to be part of my pre-surgical workup if it was my toe. I have no idea why your doctor suggested an MRI. We use MRI to evaluate muscles, tendons and specific anatomy, like soft tissue masses. Occasionally, we will order one if we have tried everything else and are puzzled. Your problem, Hallux Ridigus, is straight forward. You have arthritis in your 1st Metatarsophalangeal joint. An MRI is not going to give any additional information in your case. Although it would go to your health plan, it is completely unnecessary! MRI of Hallux Rigidus patient with surprise sesamoid injury and marked bone inflammation on the plantar surface making it difficult to walk. Dr Blake's comment: This doctor just has not used MRIs for this problem and therefore does not know where they fit in to the process. There is nothing wrong with this, but I would say MRIs can help categorize the damage in the joint by intensity and location, can show other injuries that could co-exist with the Hallux Rigidus like sesamoid arthritis. Every Hallux Rigidus is not the same, and could require different approaches. At least in 2012, where MRIs are now a proven entity, some vital information can come from it that could effect the management of the post operative period. X-rays show significant arthritis to your great toe joint Arthritis is a progressive loss of cartilage and results in stiffness and pain. 1. Period of rest from any aggravating activities: e.g. Long walks, jogging, hills, stairs. Low impact exercises would allow for consistent cardiovascular exercises without exacerbating foot pain. Such exercises include stationary or regular biking, swimming, water aerobics, circuit-training weight lifting. 3. Graphite plate inserts help reduce bending at the big toe joint. These can be purchased at Shoes N Feet in San Francisco or other Shoe stores. 4. Occasional cortisone injection is probably the most effective non-surgical means of reducing pain. Relief is temporary but may last 2 months or more. Cortisone injections cannot be done indefinitely but several done 4-6 months apart, as needed, are safe to do. 5. If non-surgical treatment fails to adequately address the pain, surgery will likely be required. Functional Foot Orthotics to change the gait pattern and weight bearing across the joint.They can also be used to limit joint motion with Morton's Extensions. Shoes selected to have the right amount of heel lift, forefoot padding, forefoot flexibility or stiffness, toe box room, and upper construction. 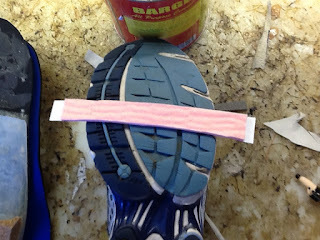 Padding to off weight shoe pressure (may vary in different styles of shoes). Daily icing and/or contrast bathes to reduce inflammation, which decreases the fragileness of the joint. Physical therapy to initially de-inflame the joint, and then strengthen the foot and work proximally at the core and down to change stressful gait patterns. Accupuncture to increase circulation for healing, and stimulate the immune system for greater healing. 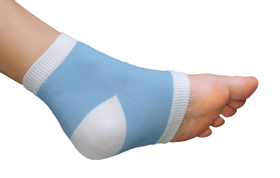 Removable casts to immobilize the joint for several months or part time on a daily basis while the joint is getting calmed down. Glucosamine and other OTC anti-inflammatories. Flector Patches or diclofenac gel to reduce inflammation. Activity modifications to avoid irritating the joint for 1 year, but allow as much cardio-vascular fitness possible. Too many others to mention (treatment should be tailored to the individual with protocols designed to create a pain free environment in a general fashion). A lot of individuals with this foot condition eventually need surgery to decisively treat the painful arthritis. This most often involves fusion (or arthrodesis) of the great toe joint. This is the surgical gold standard to treat big toe joint arthritis in an individual who wishes to remain active. It best and most predictably eliminates the pain from arthritis in a decisive manner and long-term. Counterintuitively, locking the motion in the great toe by surgical fusion, does not interfere with those who want to walk actively or even jog. Only limitations are with going en pointe in ballet dancing, > 2.5 inches of high heeled shoes, and probably sprinting. 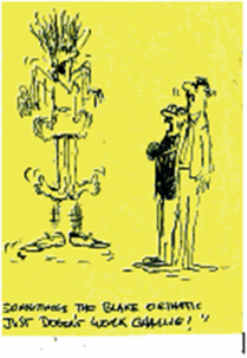 Sometimes, it can be a bit difficult to get your foot into a tall boot. Dr Blake's comments: I have treated 1000s of Hallux Rigidus sufferers and never had to resort to a joint fusion. I have only seen one patient with a joint fusion from another doc and it did not turn out well. It should be the last resort of surgical treatments. The big toe is the most important joint for push off. I just came off the basketball court, I can not imagine doing what I did without the function of the big toe. Maybe it is a better surgery than I realize, but if you can not push through the big toe joint, the push off must be more laterally causing problems related to over supination. That can give you foot, ankle, knee, hip and back problems. Also if you can not roll through your foot, you forward motion is blocked and all the problems related to Sagittal Plane Blockade may occur. So why fuse? Why not try to save the joint, and if surgery is needed, minimize the surgery (even if it has to be redone in a few years). 3. 2-4 wks of weightbearing in a orthopedic boot or shoe after the casting period. If you're not inclined towards surgery at this time, consider the recommendations above. If you would like a cortisone injection, let us know what days and times would work best for an appointment, and we can have you scheduled with one of the foot and ankle specialists. So...I'm not going to be able to get an MRI from Kaiser, but have ordered one from Health Diagnostics for January 3rd. If you have any additional information about your thoughts on the MRI, and why you think it is helpful, please feel free to share your thougths, and also let me know should you wish me to share those with my doctor. Dr Blake's comments: Jeff, please get the MRI as a self pay ($500 approx). I will see you after to discuss, and then my comments will be available to your doctor. Please look at all of my blog posts on Hallux Rigidus/Limitus, schedule an hour for the upcoming appointment, and we will have more fun. I look forward to discussing my MRI results with you when they are available. Thanks for your help, and happy New Year. 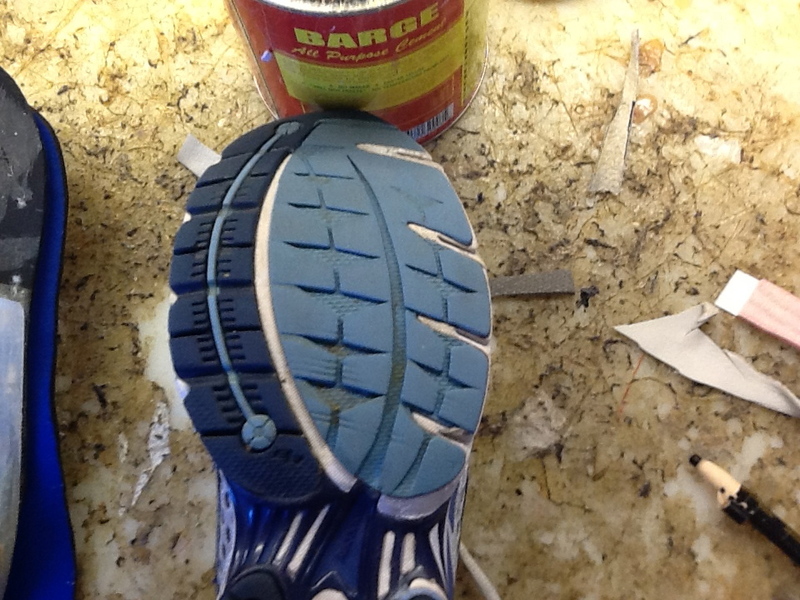 Shoe Design: Where Should a Shoe Bend When We Push Off?? 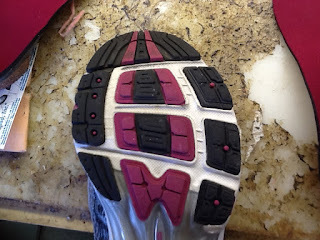 Here is the bottom of a running shoe with multiple cuts or striations that allow for shoe flexibility as you roll up onto the ball of your foot in push off or propulsion. 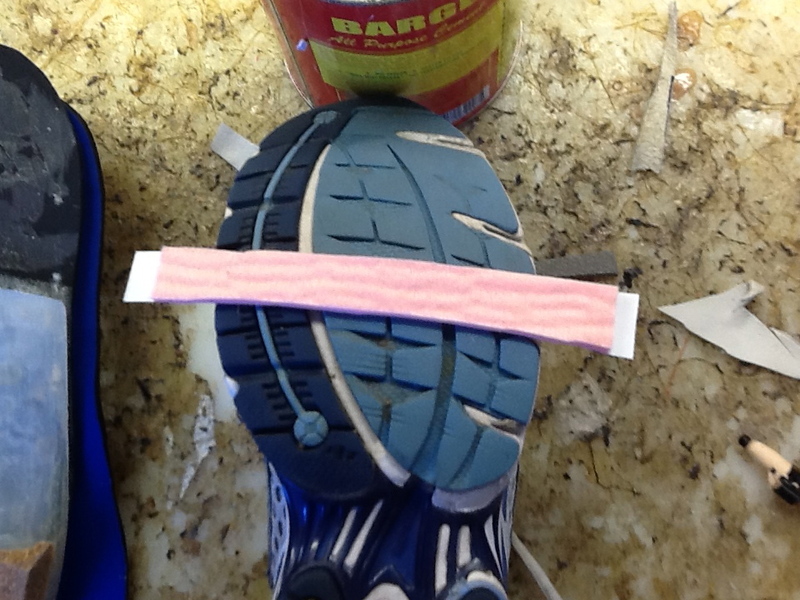 The pink material demonstrates where the ball of the foot should bend the easiest in your shoe flexion test. The multiple striations make it easy to accomplish the bend needed. 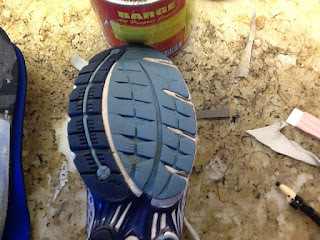 Here is a shoe where the bend is not only in the wrong position but the cuts or striations do not go all the way across the shoe. The bend of course at the big toe should be the greatest, yet in this example their is no attempt to allow for this bend. 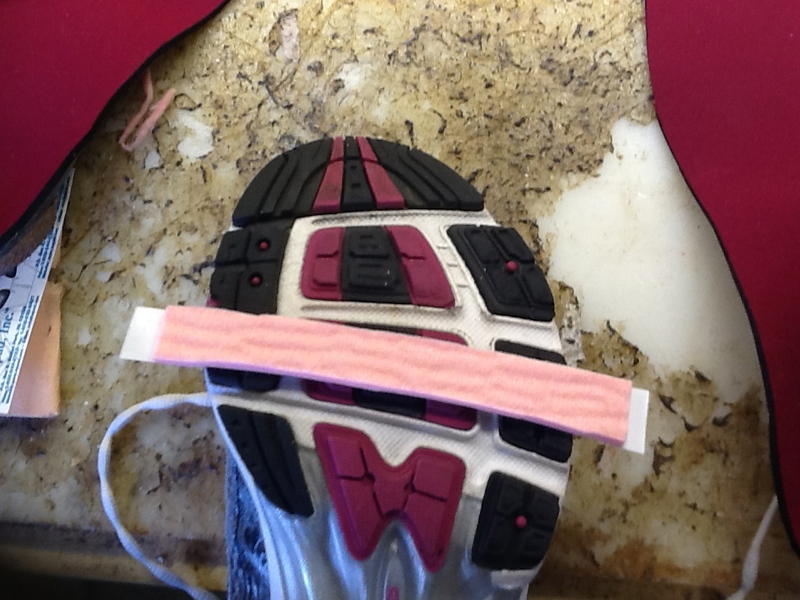 There the pink material shows where the shoe should bend, yet it lies between the two striations!! The bend at the ball of the foot should be even with the big toe joint (widest part of the foot/bunion joint), and then slightly go back towards the arch as you near the baby toe side. And, just for fun, here I am demonstrating a rocker shoe that is not meant to bend at all. You are encouraged to roll right on through and you should not attempt to push off. Here is an email I received yesterday and my response. of pocket to see a PT. with my right foot stuck in snow as the left foot slipped downward. job in my life and this may be part of the problem. environment, from braces, to shoes, to activity changes, and yes, to orthotics if that is what it takes. throwing everything in to the treatment arena but the kitchen sink (an approach used with unlimited funding). must be 30 minutes 3 times a day. Yes, 30 minutes is normally needed to get deep into the knee. pay, if your symptoms plateau (look at it one month at a time). knees, but see if you can get them calmed down, less fragile, over the next several months. Matt Forsman, aka Marathon Matt, has many great programs through the year. Of course, if you are not in the San Francisco Bay Area, you will need to find another similar program nearer to home. I hope this is a great athletic year for you all. Remember 30 minutes of exercise daily in the recommendation from the American Heart Association. Spring Fling LAUNCHES TOMORROW @ 10AM! SPRING FLING LAUNCHES TOMORROW @ 10AM! Score a deal on spring/summer programs, FREE entries into Rock N Roll Arizona, and more via the Marathon Matt Fan Page on Facebook THROUGH 1/6! 'Spring Fling' game running from 1/3-1/6! 1)'Like' the Marathon Matt page. , click the 'thumbs up' like button on the top of the page and you're set! 2)Stay tuned to the riddles I post on the Marathon Matt page between Tues, 1/3 & Fri, 1/6. Unlike the Cyber Monday game, I WON'T be posting every hour on the hour. So, you'll need to be on your toes. It's possible some riddles/discounts will only be valid for 30 minutes. Others may be valid for two hours. Unlike Cyber Monday, the Spring Fling game will be live for several DAYS (Tues. 1/3-Fri.1/6 from 10AM-5PM). 3)Score discounts on my Spring programs (Oaktown 13.1 (1/8) & Spring 13.1 (2/18)). The 'Spring Fling' moniker probably tipped you off, but the discounts I'll be extending are ONLY applicable to my SPRING programs (Oaktown 13.1 & Spring 13.1). Unlike the Cyber Monday game, there won't necessarily be a consistent increase in riddle difficulty and discount amount. This means a $30 discount may randomly appear in association with a particularly tough riddle that's live for 30 minutes only to be followed a few hours later by a softball riddle only good for $10 off. Become a Marathon Matt Fan! The cold, wet months of winter are upon us. On the upside, it's chili weather! Before I delve into this recipe, I have to give credit where credit is due. This recipe is a variation on a wonderful recipe I got from Micah Dickerson. Thanks for the inspiration, Micah! Ingredients: 1.5 pounds of ground turkey, a cerrano pepper (finely minced), one medium yellow onion (chopped), ginger (one tablespoon finely minced), 3-4 cloves of garlic (pressed), a can of Guinness, a can of tomato paste, one can of kidney beans, one can of black beans, quinoa (one cup), a large can of whole tomatoes, one carrot (chopped), one ear of corn (just the kernals), chili powder, chipotle powder, cumin, coriander, cinnamon, and curry powder. Saute the onion, cerrano pepper, garlic, and ginger in 2-3 tablespoons of olive oil until onions are soft. Brown turkey in the aforementioned. Once the turkey is browned, pour the can of Guinness in and reduce for a few minutes. Add tomato paste and the large can of tomatoes (with tomato juice). Make sure to break/crush the whole tomatoes. Add the chopped carrots and corn kernals. Mix in 3 tablespoons of chili powder, 3 tablespoons of chipotle powder. Through in a dash of cumin, coriander, curry, and cinnamon. Mix in the kidney beans and black beans and let simmer for 5-10 minutes on low/medium heat. Add a cup of quinoa (if desired) and cook until quinoa is soft/tender. Be advised the chili will be quite thick after mixing in the quinoa. I like my chili pretty spicy/hot, so I sometimes add additional chipotle and/or chili powder. I've got BIG things planned for 2012 including a total of SIX half marathon training programs, a handful of 'fitlanthropy' programs for those of you wanting to get fit AND be philanthropic, and much more. Score discounts off my spring programs via my 'Spring Fling' running from 1/3-1/6! My first program of the year, Oaktown 13.1 launches on Sunday, 1/8 @ 9:30AM at the Presidio Sports Basement. Not too far behind Oaktown 13.1 is Spring 13.1 launching on 2/18. But, before these programs get rolling, I'm giving you a shot to score some discounts this week! Spring Fling runs from 1/3-1/6 and is like my Cyber Monday game on steroids. As an added bonus, I've got TWO FREE ENTRIES TO THE ARIZONA ROCK N' ROLL MARATHON on 1/15 in the mix! Check out the details to the LEFT. Come celebrate the new year with me at Presidio Sports Basement on Sunday, 1/8 from 11AM-1PM! Even if you have no intention of joining Oaktown 13.1, I'd STRONGLY encourage you to join me at Presidio Sports Basement from 11AM-1PM for a little launch party madness! Why? FREE BEER FROM LAGUNITAS, DJ MATT HAZE SPINNING, RAFFLE PRIZES UP FOR GRABS, BAGELS, ZICO COCONUT WATER, and 20% OFF AT SPORTS BASEMENT! Oaktown 13.1 gets rolling on SUNDAY, 1/8 @ 9:30AM. Spring 13.1 launches on SATURDAY, 2/18 @ 9:30AM! In 2012, I've got not ONE, but TWO spring programs lined up. The first program gets started on SUNDAY, 1/8 @ 9:30AM. This program is based in Golden Gate Park and includes a coached run workout on Wednesdays @ 6:30PM & Sundays @ 9:30AM. Oaktown 13.1 will have you prepared for the Oakland Half Marathon taking place on 3/25! Not to be outdone, Spring 13.1 launches on SATURDAY, 2/18 @ 9:30AM! This program is based in the Marina and meets on Tues @ 6:30PM, Thurs @ 6:30PM (Accelerate bootcamp or Need for Speed), and Saturday @ 9:30AM. Spring 13.1 will have you prepared for the American River Parkway Half Marathon in late April/early Mayand/or the Divas Half Marathon in SF on 5/6. Accelerate is BACK on 2/20/12! If you enjoyed Accelerate bootcamp with Gaby Miller of Ab Fab Fit in 2011 and want to accelerate your running fitness, we've got you covered. Meeting on Mondays & Wednesdays @ 6:30PM from 2/20-5/9, you're looking at an incredible deal...20 workouts for $100! *NOTE-As an added bonus, all Accelerate participants receive $10 off my Spring 13.1 program! Passport 2012...your journey begins here.. I always feel a bit awkward when people ask me about my 'running club'. This is in large part because I don't think of what I manage as a 'club'. Nothing against running clubs, but when I think of clubs, I think of casual, informal gatherings that may or may not have a specific goal or direction and have no clear beginning or end. Without sounding too grandiose, I like to think of what I do as providing 'running journeys' (or 'odysseys'). So, are you ready for an adventure or two in 2012? Are you ready to meet some remarkable people? Are you ready to discover things about yourself that you didn't know? Are you prepared to do things you didn't think you were capable of doing? Join me this year! As always, the earlier you register, the better price you get.